Sri Aurobindo was sent away to England at age seven because his father wanted to shield him from all influences Indian. But paradoxically, he went on to become one of the most powerful exponents of the Indian culture. Sri Aurobindo's spiritual collaborator, the Mother, who had studied the Gita as a teenager, finally came to India in 1920, and stayed here till she left the body in 1973. This book brings together, from the works of Sri Aurobindo and the Mother, some of the most educative and striking pieces about the Indian culture. 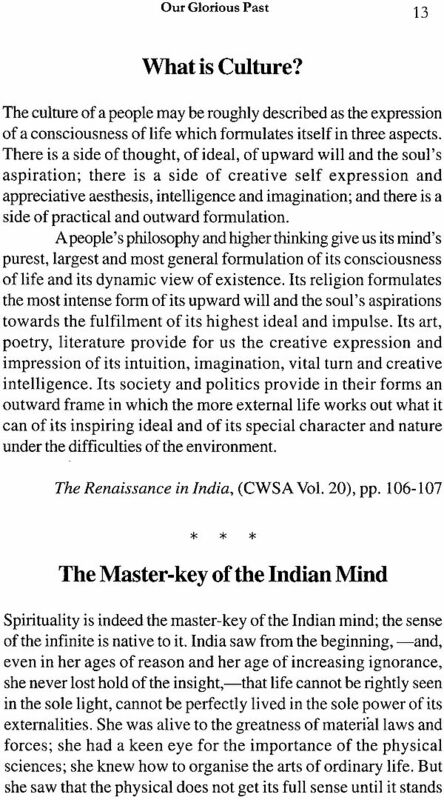 The ancient Indian wisdom has something unique, which the materially saturated but spiritually starved western world is looking up to India for. The wisdom has the timeless key to living a full and fulfilling life, besides having potent, infallible prescriptions for lasting mental peace. This book is a window to that wisdom, a mere introduction that may stimulate the reader to delve deeper into the works of Sri Aurobindo and the Mother. Surendra Nath Jauhar: Born August 13, 1903 at village Vahalee, Distt. Jhelum (now in Pakistan), resident of Sri Aurobindo Ashram, New Delhi. Education at D.A.V. College and National College, Lahore; member D.C.C. (1939); member P.C.C. (1943-47); took part in the Civil Disobedience Movement (1930) and the Quit India Movement (1942); defied Martial Law Regulations (1919) and suffered beatings and forced marches under the British Sergeants. In 1930, organised boycott of foreign cloth throughout the 'Katra' of Chandni Chowk; November 14, 1930 read the Congress Independence Day Resolution at the Clock Tower; arrested and tried on six different counts; sentenced to nine months' R.I. and Six months' R.I. in the Central Jail Multan; tortured in Jail and released in 1931 on account of Gandhi-Irwin Pact; in 1942 went underground and worked with Shrimati Aruna Asaf Ali and Shri Jugal Kishore Khanna; arrested on September 17, 1942 after fierce fighting at the point of pistol; dragged along with his wife in Connaught Circus followed by thousands of people; in the ensuing scuffle, the Magistrate on duty ordered to shoot him dead, escaped providentially; tried under various counts for about two years and acquitted on May 6, 1944. Sri Aurobindo has been a unique figure in human history. He spent 14 years of his early life studying in England, and the next 14 years teaching himself Sanskrit and delving deep into the ancient Indian scriptures. Endowed with an exceptionally brilliant intelect, these external circumstances in his life led to a remarkable synthesis of the East and West. To top it, he had remarkable spititual capacity, of which he gave evidence at Baroda in 1908 by attaining total silence of the mind and achieving a satate of nirvana within a mere three days. 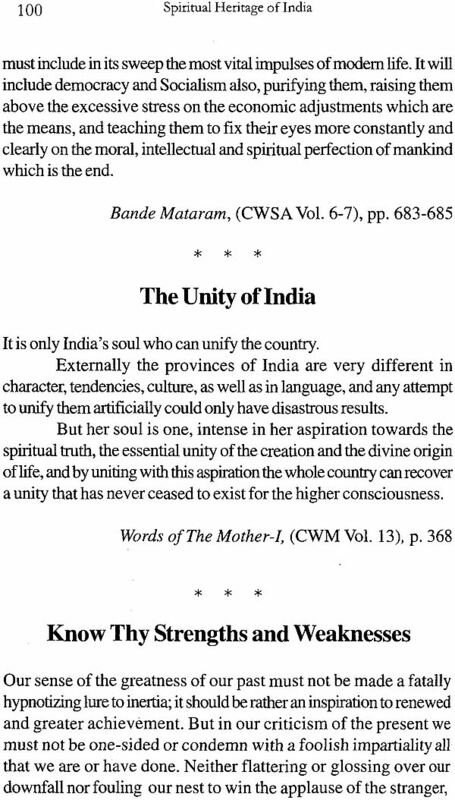 One of the results of this unprecedented combination was an outpouring of spiritual literature based on the Indian tradition, the original of which was written in the English language. In this categary, his works remain unsurpassed to this days, both in quantity and quality. In keeping with his life-affirming spiritual philosophy, there was hardly a subject under the sun that he did not touch, and he gave whatever he touched a unique and timeless spiritual orientation. Be it arts, philosophy or science; history, economics to politics; education, psychology or sociology; nothing escaped his all-embracing mind and penetrating gaze. Therefore, although the focus of his works was on spirituality, mundane aspects of life have inevitably enriched them, and also enhanced their relevance to everyday life. 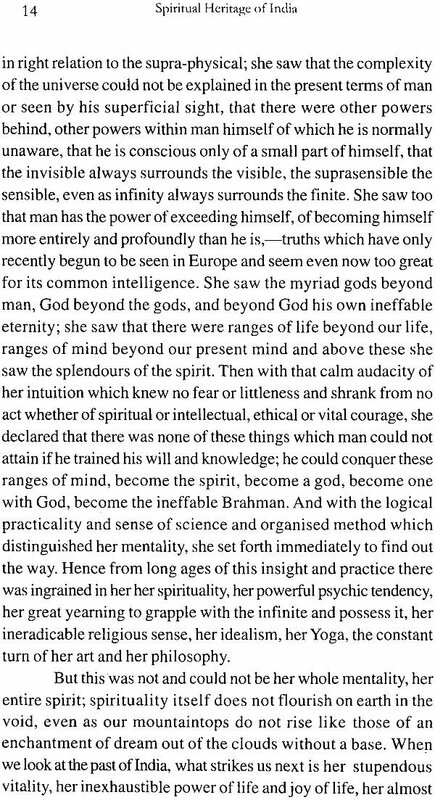 To Sri Aurobindo's rich philosophy, the Mother added her divine touch, and demonstrated through the 'laboratory' that she created at Sri Aurobindo Ashram in Pondicherry that the philosophy could be translated into practice for organising human life around a higher level of consciousness. 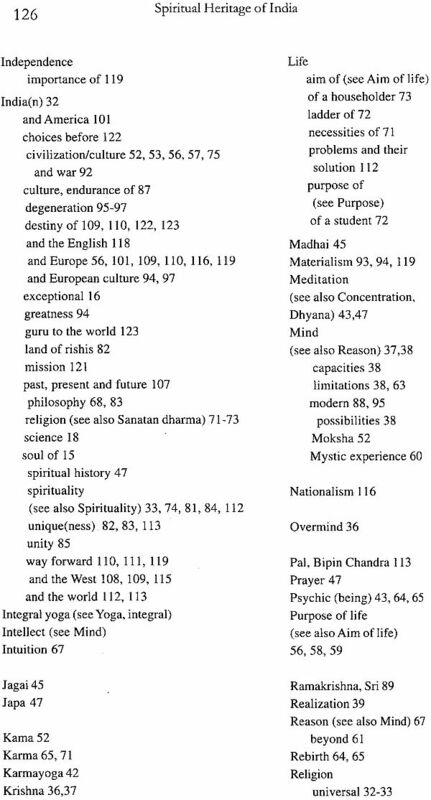 The present compilation on the spiritual heritage of India is neither comprehensive nor representative; it is merely an arbitrary and inadequate sampling that gives a glimpse of Sri Aurobindo and the Mother's words on the subject. Its aim is to inspire the reader to go deeper in to their works. 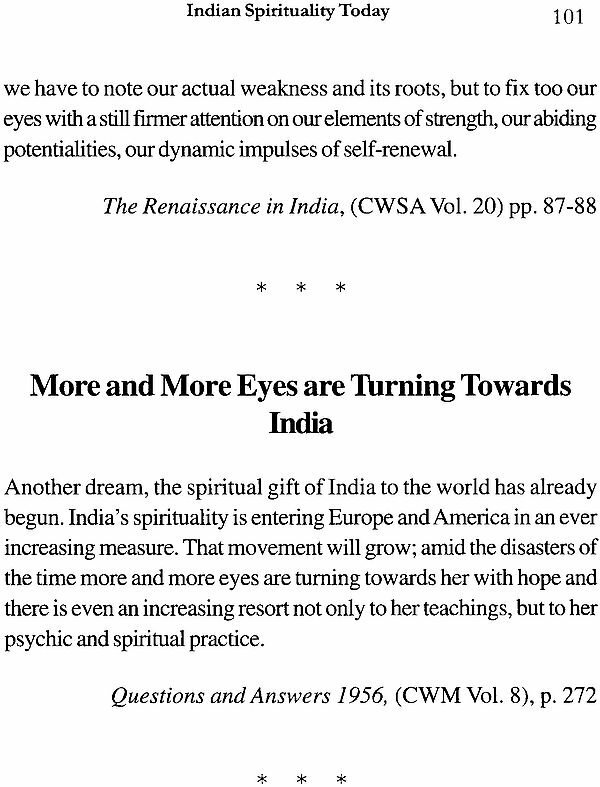 Sri Aurobindo understood India's past as few ever have; was deeply concerned about the present, and many of the painful realities that he saw a hundred years ago are still with us; and the way he combines optimism with realism while deliberating on the future is an inspiration and education for anyone engaged in working for a better tomorrow. Though the compilation does have three sections - past, present and future-the fact is that it is impossible to divide the passages neatly into three categories for at least three reasons. First, Indian's past is perennial, and has great relevance to the present and the future. Secondly, India's past has in many ways flowed into the present, despite the varied, often tumultuous, onslaughts of history. Finally, many of the selected passages had material relevant to at least two sections. The heading for each passage has been supplied by us, either using a key expression in the passage itself, or coined so as to give an idea about the contents. Sri Aurobindo and the Mother's works have the potential of playing a major role in giving India, and the world, a better future. They have in them a complete prescription for 'the remaking of man', to borrow an expression from Alexis Carrel's Man, the Unknown. It is our fond hope that the compilation will succeed in stimulating interest in the works of Sri Aurobindo and the Mother, especially among the youth. 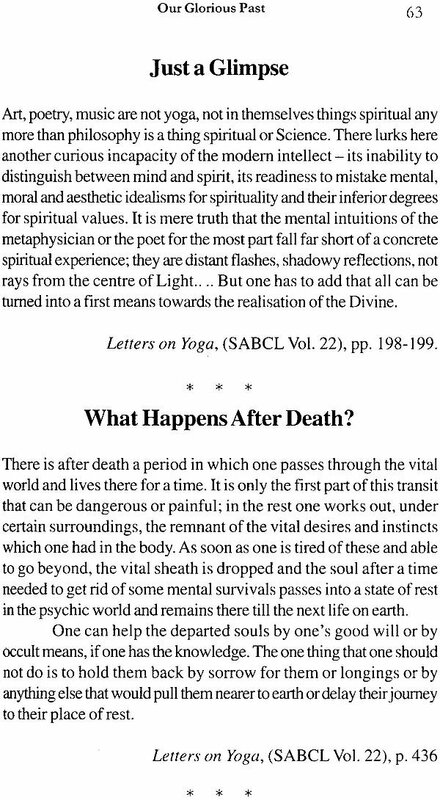 The publication of this compilation coincides with a symposium on the same subject at Sri Aurobindo Ashram - Delhi Branch from 31 August - 4 September 2011. The idea of celebrating the release of a postage stamp in honour of Shri Surendra Nath Jauhar 'Faquir' (Chacha ji) through the symposium and this compilation first came from Tara Didi. We are grateful to her for the idea, the inspiration, and last but not least for the joy that working on the compilation has brought us. We are indebted to the trustees of Sri Aurobindo Ashram, Puducherry, for permission to use published material from the writings of Sri Aurobindo the Mother. 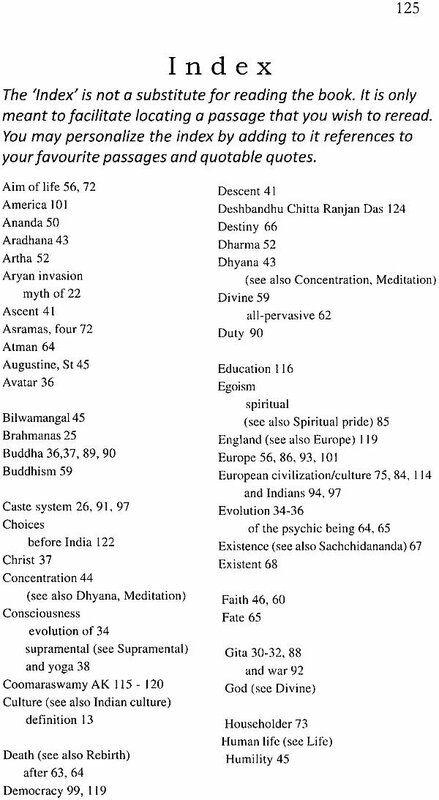 India has a unique and sustained tradition of spiritual exploration going back to at least 5000 years. The Vedas, The Upanishads, The Bhagavadgita, Ramayana and Mahabharata are among the best known fruits of this tradition. The breadth and depth of these classics in the Sanskrit language remains unparalleled in human history, but that has not prevented the seekers of later times from going on an independent quest, and recording their experiences in comparable works in various languages and formats. Buddha gave us similar works in Pali, and Guru Nanak in Punjabi. Much nearer to our times, Sri Aurobindo gave us The Life Divine and Savitri, which may be considered modern day Upanishads in the English language. Further, Sri Aurobindo has also given us a critical appraisal of our past, entered the very heart of our heritage and culled from it what is of lasting value, and provided guidelines on how our past may be remoulded in today's context to enrich the current civilization on the global scale. Thus his writings on the past are neither an uncritical rendering of the ancient wisdom in the English language, nor a desperate cry to mourn its demise. Rather, his writings provide a constructive approach to the past. He has sifted the grain of perennial value from the chaff, and used it for a powerful synthesis of the past and the present for a future that will surpass anything that the world has seen so far.